NVIDIA certainly outdid itself with the launch of the GTX 1080 Ti but none of the partners had any custom AICs (Add-In-Cards) ready and it’s only been a week since we’ve started seeing ridiculously overclocked SKUs from each manufacturer. 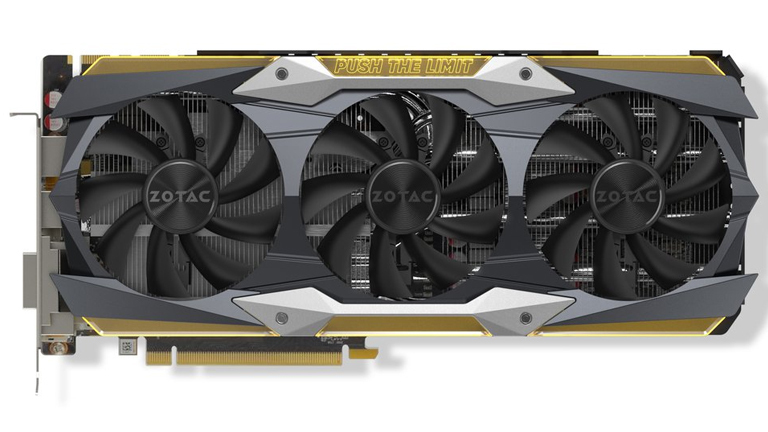 And the latest manufacturer to unveil their non-reference GTX 1080 Ti is none other than ZOTAC. Earlier yesterday, ZOTAC put out a teaser across all their social media indicating that their custom GTX 1080 Ti cards were on the way and today they’ve revealed the entire line up and SKU details. 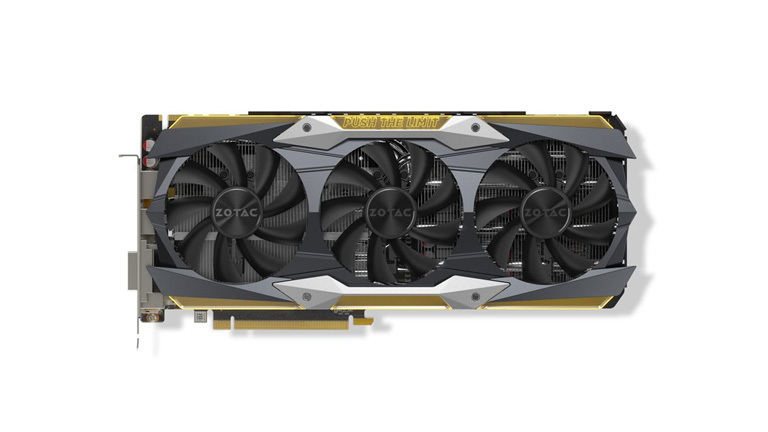 Aside from the ZOTAC GeForce GTX 1080 Ti Founders Edition, ZOTAC will have three other variants – ZOTAC GeForce® GTX 1080 Ti Blower, ZOTAC GeForce® GTX 1080 Ti AMP Edition and the flagship ZOTAC GeForce® GTX 1080 Ti AMP Extreme. The top of the line GTX 1080 Ti features a slightly different look from the non-Ti GTX 1080 AMP EXTREME which featured a carbon-fiber like texture on the body. The GTX 1080 Ti AMP EXTREME Edition has an anodised aluminium look with golden accents with their tagline ‘PUSH THE LIMIT’ emblazoned across the top. The card is quite beefy and will take up 3 PCIe slots so if you were planning on building an SLI configuration then pick a motherboard with a two slot gap between the two x16 slots. The power hungry GTX 1080 Ti graphics card will be powered by 2x 8-PIN PCIE power connectors. 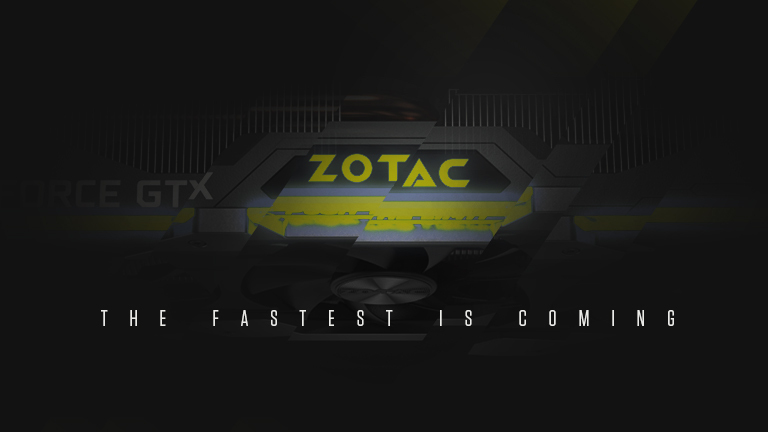 As for the clock speeds, the ZOTAC GeForce GTX 1080 TI AMP Extreme Edition will have a base clock of 1645 MHz which is a massive 165 MHz ahead of the stock GTX 1080 Ti. GPU Boost clock takes it further to 1759 MHz and the memory is clocked at 11,200 MHz. Like the reference card, it will feature one HDMI 2.0b connector and 3x DisplayPort 1.4. Also, the card will feature a DL-DVI-D port unlike the reference card. Like previous AMP Extreme cards, the cooling assembly on the GTX 1080 Ti AMP Extreme will also feature three 90 mm fans.